Have you ever tried to use your bread maker to bake a cake in? I have! Ever since I had my bread maker for Christmas, I had been curious to try out the recipe that came in the book for a Madeira Cake. Madeira cake is a pretty heavy sponge recipe anyway but I have to say I wasn’t really too impressed with the results. The bread maker obviously doesn’t have eyes or fingers to poke the cake with to see if it is ready so the cake was far too over cooked around the edges. 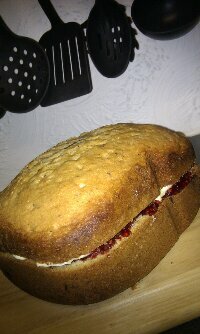 It was so dry that I filled it with lots of buttercream and jam just to try and give it some moisture. Luckily the birds seemed very happy to be receiving the end pieces to eat – though I’m surprised they weren’t too heavy to fly afterwards. The other reason I would advise against making a cake in your bread maker (unless something terrible has happened to your oven and you just have to have cake and you can’t get to a shop to buy one) is that the bread maker only does the baking part. All the ingredients you have to weight out and mix by hand and then you put it into the bread maker just to bake it for you. And if you’ve ever baked a single cake you know that it is no hard feat just to put it in the oven, that’s the easy part. So, my review of my bread maker cake… Don’t do it unless you want a heavy, dry, crumbly cake which is only good for birds.